I plan to do a reorganization when KSV arrives. Too much stuff is organized too oddly, so will try to get it more sensible. Glad we are not the only ones with a mixture of storage methods. We have some large terrain pieces that require deep drawers to keep safe - some old resin FW pieces - but we need more shallow drawers like you have in the second pic, always on the lookout for cheap plastic drawers. Currently we stack a shed load of really useful boxes, problem is we have been getting them piecemeal and so have no plan on what goes in what box - just what needs putting away at the time. That is a fine collection of stuff. 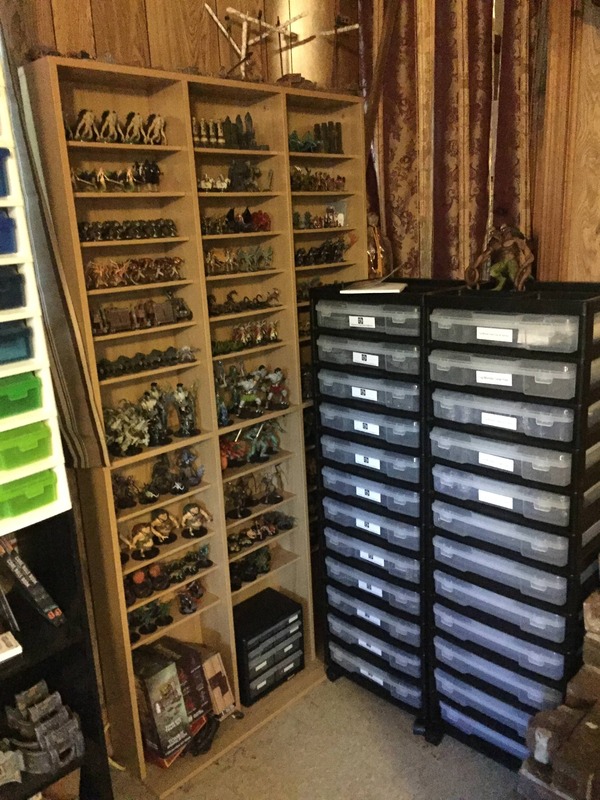 I keep all my resin stored in my 15 drawer flat filing cabinet also in there is any fragile things not Dwarven Forge. For all my other Dwaven Forge stuff from KS1-KS5 I use stack on IRIS 6-Drawer Scrapbook Carts you can stack 2 on top of each other making it 12 high. You can also break it down to any combination you want. I have some stack that are 10 high that are sitting on a book shelf. I then us a DYMO LabelWriter 450 to put a label on each container so I know what is in it. For my small and medium sized miniatures I use Akro-Mils Drawer Plastic Parts Storage Hardware and Craft Cabinet to store them in. I use a Brother label maker to mark what is in each drawer of them. Then for large and above miniatures I store them on a CD/VCR storage book case. Now granted I have an entire room detacted for storage and playing games in, so room has not become an problem yet but it is getting tight on space now. This is one wall and one corner of the room to show how it looks. This one still have some empty storage containers that will be used for some of the KS5 stuff. I have not put any of it into storage yet. I need to wait until I get it all in so I know what will fit in what container. I have thought about painting a small subtle indicator on the tops of the magnetic walls to make it easier to locate in the storage drawer and also in a complex. Those wall features are not all visible when the players first encounter them (kind makes a trap useless if everyone can see it ahead of time...that is what repeated MMO dungeons are for....take 10 strides and then jump over the known trap...along the right side of the passageway. Mine, within a category like dungeons or caverns, are basically broken up by structural vs small. All the small pieces and decoration (columns, furnishings, magnetic pieces, some stairs, 1x1 and 1x2 floors, etc...) go in a compartmentalized container like a tackle box or crafting organizer. The bigger pieces are what I think of as structural... I have smaller boxes, and/or tubs, and/or cardboard dividers in my larger bins. I take a similar approach as Vegomatic. It's generally worked so far. 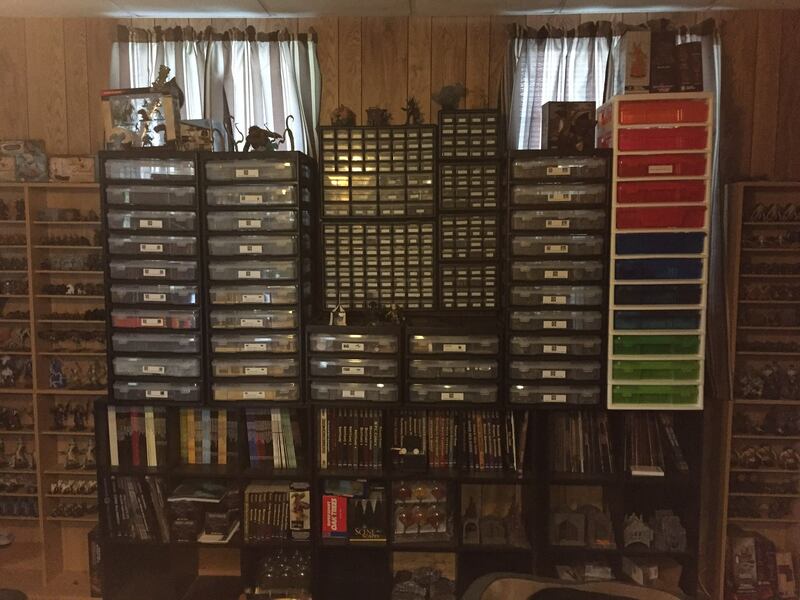 Though I do think that with my DOD I plan to separate out the LED and magnetic walls/corners (probably just in a gallon Ziploc or something within the broader dungeons storage bin) so that I can more readily identify those accent pieces without hunting through every piece.